The Lange site represents a single occupation dating to the Lohmann phase. The Lange site encompasses a 0.61-hectare area within the uplands overlooking the floodplain of the American Bottom near Glen Carbon, Madison County, Illinois. Archaeological investigations conducted by Prairie Archaeology & Research (then known as Environmental Compliance Consultants, Inc.) in 2003 resulted in the identification and complete excavation of fifteen prehistoric pits, four Mississippian structures, and two marker posts. The Lange site is a multiple structure site, which we believe was specifically designed and intended as a civic and/or ceremonial nodal center utilized sometime during the transitional Lohmann to Stirling phases (A.D. 1000 to 1050) of the Mississippian period. 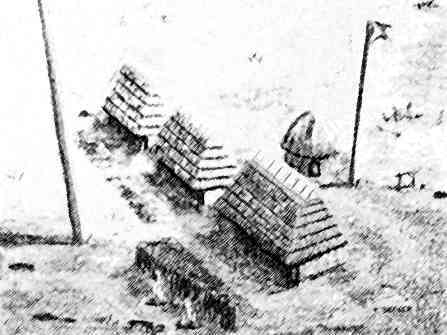 The archaeological signature of the Lange site included a number of specialized architectural elements such as marker posts, community houses, screens, and a sweat lodge. The spatial organization of the Lange site was remarkable in the degree of planning that is evident. In fact, no other Mississippian archaeological site in the region exhibits such an obvious degree of communal intent and ritual purpose. Specifically, this project was promulgated by the Illinois State Agency Historic Resources Preservation Act (20 ILCS 3420, as amended, 17 IAC 4180), which requires a review of all state funded, permitted, or licensed undertakings for their effect on cultural resources. Not only do the results of the excavations at Lange shed light on the mechanisms of power and authority in the rural districts of Cahokia, but they provide insight into the expressions of consolidation and sacralization of Cahokian political authority. Archaeological data recovery at the Lange site was required in order to mitigate the adverse effects of the residential development construction by R.L.P. Development Company of Edwardsville, Illinois, and to comply with current legislation regarding the management and protection of cultural resources. 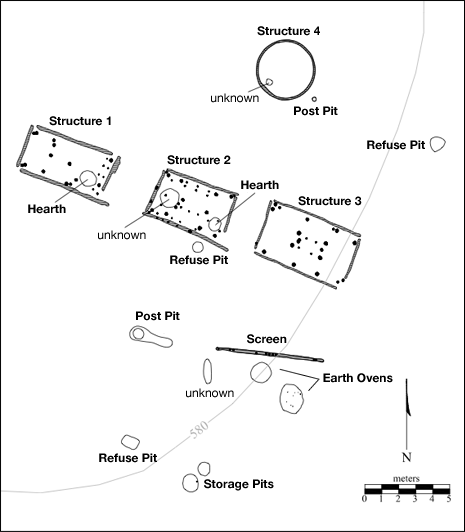 three structures, marker posts, pit features, and wall partition.